Art Museum of Southeast Texas - Abigail McLaurin: "Tongues Talking"
AMSET presents Abigail McLaurin: Tongues Talking on view March 13 through June 1, 2014 in AMSET's Cafe Arts. time gigs at the local theater to supplement her income. In 2012, she quit her job and moved to Beaumont to pursue art full-time. "I’m fascinated by the subconscious nature of the figure undefined what is not obvious, what is strange or awkward, what is obscene, what is taboo," states McLaurin. "I try to decipher and capture this humanity through imagery that suggests spirituality and family. My work resonates with a significance beyond what is initially observed." Tongues Talking is part of AMSET’s continued mission to feature local artists in Café Arts. 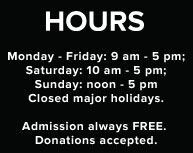 The exhibition is open for viewing during regular museum hours: Monday through Friday: 9 am - 5 pm; Saturday: 10 am - 5 pm; Sunday: noon - 5 pm. Two Magnolia’s serves lunch in Café Arts from 11 a.m. to 2 p.m., Monday through Friday. For more information, contact AMSET at (409) 832-3432 or visit www.amset.org.